Phillip DePauk lived in Van Nuys in the 1950s. His grandfather owned a photography studio located at Gilmore and Van Nuys Blvd. These photos come from his archives and he kindly consented to allow me to publish them. In Mr. DePauk’s images, one can see some of the rapid changes that came to Van Nuys in the late 1950s and early 60s: demolition of old houses on the site of the Valley Governmental Center, the widening of Victory Blvd. Before WWII, Van Nuys had been a small town surrounded by orange and walnut groves. One could literally walk from Van Nuys Bl. over to Hazeltine’s agricultural area. After the war, the Valley and California exploded in population. Every square acre of land was developed for housing, shopping malls, freeways, and factories. We often think of the 1950s as a halcyon era of perfect families and happy times. 1948. Grandfather's home at 14248 Sylvan St. Van Nuys. 1/4/1952: Near Van Nuys Grammar School/Tyrone & Gilmore Sts. But the seeds of California’s destruction were born in the 1950s. The car was king so roads were widened and pedestrians marginalized. Vast shopping centers destroyed local shopping and emptied out Van Nuys Blvd. Historic old houses were razed and replaced with faceless office towers and parking lots. Citrus groves were obliterated and local agriculture disappeared from the San Fernando Valley. And conservatives welcomed vast migrations of undocumented workers to California as a source of cheap labor. And liberals championed an ethnic centered curriculum to teach children that American history mattered less than group think identity. And that ethnic empathy for some triumphed over lawful behavior for all. And conservatives said that government was evil. The same government which might have enforced the law. And liberals said that government could do everything. Robbing individuals of the consequences of their own actions. And Californians went to the polls to ignorantly legislate by ballot those issues that were already decided by lobbyists spending millions on TV advertising. And today we live in the midst of what we have wrought. No place in Van Nuys looks as good today as it did in 1950 and Mr. DePauk’s photos, even of flood ravaged streets, somehow seem more civilized than a sunny day on Vanowen and Kester in 2010. Lived on Cohasset street 1957-1969. First job was at the huge corn field farm a half block north of the home, ending at the GM plant. The farm became industrial; Borg Warner, Utility Company, Oscars Restaurant on Van Nuys Blvd, Palleys Surplus north about a block-that’s where I learned that spending my allowance was really fun. Hazeltine, Robert Fulton then Van Nuys High. Onto Valley State but nearly flunked out; transferred up to UC Berkeley. Think about Van Nuys, but it’s true, you can’t go home again. Savor the memories! Wow! Stumbled apon these pics and couldn’t believe it! I grew up in Van Nuys too! From 1960 -1965, I lived on Parthenia St. between Woodley and Balboa. Then I remember at 5 years old, after the Parthenia house was torn down because of termites, we lived on, of all places, Blythe St. off of Van Nuys Blvd. (across from the old GM plant). Remember cruising up & down the street on my ‘big-wheel’ by myself. Never a problem. Funny, as so many years passed I could never think of living there considering I am white, and it became gang territory and drug-infested there! Then, I lived at 14028 Bessemer St., near Hazeltine from 1965 until 1983! Went to Van Nuys Elementary, Van Nuys Jr. High, Van Nuys High, then Valley College, (so I know a lot about Van Nuys, obviously)! My first apartment was on Woodman Ave. near Kittridge. Lived there almost 10 years! The most ironic thing though, IMO, is the fact that my mother lived on Bessemer St. when she was young, and so did my grandmother and grandfather before that! They called it Bessemer Gulch back then! I remember being on the front page of the Valley News and Greensheet in a photo with a story about the 3 generations living there! Grandma & Grandpa came over to California on a wagon train around 1912 from Oklahoma! I have some pictures somewhere of Van Nuys Blvd. when it was a dirt road! There was nothing but empty spaces and orange groves then! There were deep ruts in the street and the cars of the day had wooden wheels, and basically you didn’t need to steer unless you wanted to turn left or right, and then your car would go up and over the ruts until you settled into the next lane, when your wheels would settle back down into those ruts! At some point there was a trolley running down the middle of the street I believe. Serious roots I have in VN! 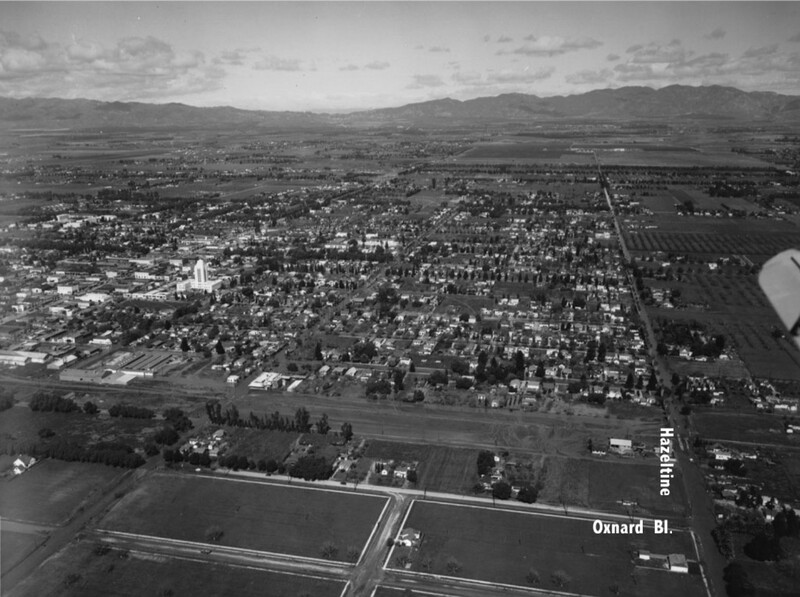 I love seeing old pics of Van Nuys, my home, for most of my life! I remember where everything was back then, from the Army/Navy store and California Aquariums, to the Fox and Capri theaters! It was a great place and those were great times, man! Please everyone, post your old pics for us all to reminisce about! Thank you for that, you guys! Does anyone remember Jack and Jean’s family restaurant on Sylvan Street across from the City Hall. Moved to Van Nuys in Aug 1954, my uncle had the Rainbow Roller rink on Calvert st. Loved being around the rink listening to all the latest rock music. My dad Roy and my uncle Stan opened Northridge in 1958. Skated there until 1968 when they sold the business. To my knollege no other rinks played rock music in those early years, it made all the difference. Hello Dave, I have no pictures of the Rainbow Roller Rink wish I did. I appreciated your responce, maybe somebody out there has some pics. Anyway thanks Howard Bannister. Nice to hear from the Banister family. I attended elementary through high school with Sue. Where is she these days, I’m in Oregon. Mr. Thomas really don’t keep in contact with my cousins Wayne, Linda and sue. I did see Sue about ten years ago at my fathers funeral, and a few years before that at her fathers funeral. I heard she plays a lot of golf. I think she is unmarried. Anyway sorry I don’t have more for you. My husband, nick-named Pancho, used to hang out at the roller rink. He remembers your cousin Wayne. In fact, we bought Wayne’s 1951 Ford. Cutest car ever. Copper color, pinstripping, white wall tires, tuck and roll upholstery. My husband did some tractor work for Stan at the Northridge rink. Hi I met my future wife at Rainbow we are still married [50 years] I was searching for pictures of rainbow.. We knew Stan the skating guard a good guy. We went to a party of his and drank home brew. Don’t know if that was your uncle. We have many memories there. Hello did you also go to a popular dance place in Northridge 1969-1970? To Howard bannister. I remember the dance place in Northrudge 1969-1970. Did you go there too? Went out of business a long time ago. Do you know what is that place now called? I have been living on Gilmore st for 16 years which is my whole life. Lived in Van Nuys at several addresses over the years. Worked at the Army Navy Surplus pictured at the SW corner of Erwin and Van Nuys. Also worked at the car dealer pictured in the photo of the Orange Bus crossing. The glass building on the right. And other places along the boulevard. Skated at the Rainbow roller rink on Calvert which became Van Nuys Iceland and continued to skate there for several years. Was a cruiser from about 61 to about 68. Bob’s Bigboy to Oscars drive in and back. Short time at Van Nuys High on Cedros. Many memories. Really nice looking at the pictures. Very interesting to see how rapid the ‘progress’ is when one considers how long the first people had been here before. Hello Sue. I used to hang out with your sister Virginia (Ginny). We would go to your dad’s shop after school, then to the donut shop next door, then go ride the elevator at city hall.Where is Ginny now? I lived on Calvert St. live in Simi Valley now. for when Tyrone St flooded. A laughable joke for those who platted Van Nuys is that they built the town on the wash which became Tyrone St–and so Van Nuys Bl would flood–many times–almost every winter. And so–when William Whitsett, the town’s biggest booster from l9ll on, built his own “memorial”, his S+L Valley Federal Savings building, the tallest building in Van Nuys, (just north of Vanowen–the now-called Phoenix Building) it was built on one of the most flood prone lots in town. A marvelous irony exists for one who looks–by l960, an expensive flood control project directed the old wash through Pacoima to the concrete Tujunga Wash–but the odd paved-over gully from Van Nuys’ “every winter’s nightmare”, the Tyrone Wash, still remains as the “dip” in the back parking lot. I remember you Tom Drummond from Van Nuys Elementary to Van Nuys High. I doubt you remember me I was shy. Thank you for these pictures…lived in Van Nuys from 1951 to 1960..went to V.N. Elem and V.N. Jr.Hi….pictures bring back many memories..used to live on Sylvan and Tyrone area…remember the “bridges” they put over Tyrone…. My father had a TV repair shop on Ventura Blvd in the late ’40s and early 50s. I am trying to remember exactly where it was as we left when I was about 6. It was called Bill’s TV Repair. Anyone remember it and where it was?